Texas Attorney General Ken Paxton and officials from nine other states on Thursday urged the Trump administration to end an Obama-era program that’s allowed hundreds of thousands of undocumented immigrants to live and work in the country without fear of being deported, via Texas Tribune. 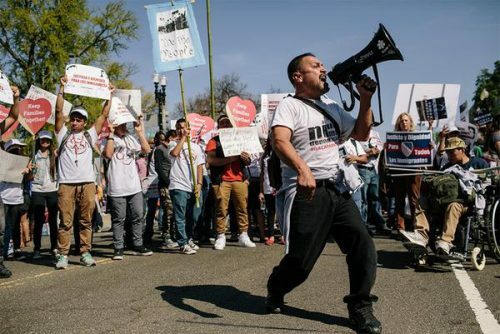 The DACA initiative preceded a broader but ill-fated 2014 program, known as DAPA, which would have expanded the eligible population of the program and lengthened the work permits to three years. That program was never implemented after the state of Texas sued the Obama administration and successfully convinced a district judge and an appellate court that Obama overstepped his executive authority. Last year, the U.S. Supreme Court split on the matter and upheld the appellate court’s decision. The Trump administration officially rescinded that policy earlier this month but said that DACA and some expanded DACA permits would remain in effect. Paxton argued in Thursday’s letter that that’s not good enough and warned that if the 2012 program isn’t rescinded, he and the other plaintiffs from the 2014 lawsuit would go back to court to settle the issue. This entry was posted in KRTS News, KXWT News and tagged DACA, Ken Paxton. Bookmark the permalink.